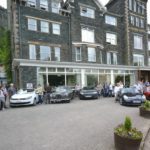 The Midlife Crisis Car Club hits the Lake District, on a recent stay at the Lodore Falls Hotel. 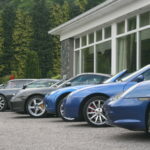 The Car Club is made up of a bunch of over the hill nuts with a passion for motoring, based in and around the towns and villages of North Hertfordshire. 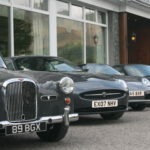 Their cars vary widely from vintage or classic designs to sports cars of all ages. 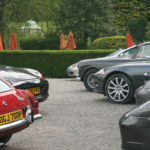 Despite being linked by a fascination for cars the members are as interested in social activities as purely technical events and the club offers events to suit both tastes. Twenty-three members set off on a gloriously sunny Friday morning in twelve cars – five Porsches, three MGs, an Alvis, an MX5 and a VW cabriolet. 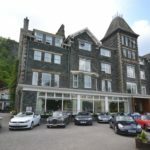 The destination was the four star Lodore Falls Hotel, where the group stayed for 3 nights, with ‘tulip’ routes planned for each day, provided by Charles Graves, Director of Lake District Hotels. Clear blue skies greeted the group on the Saturday morning when they set off on a ‘tulip’ route taking in some amazing, mainly traffic free, roads through picturesque parts of the Lake District. 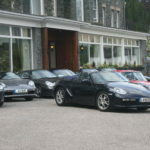 Lunch was at the Lakeland Motor Museum, before returning for tea and crumpets in the garden of the Lodore Falls hotel. The weather was again fine on the Sunday as the car club set off on another tulip route, taking them across the Wrynose Pass and the Hardknott Pass. The stunning (and occasionally challenging) drive of the Wrynose Pass is said to be one of the steepest in England with gradients up to one in three. Lunch was at Muncaster Castle, where parking had been reserved, after a brief detour to the coast at Ravenglass, the scenic journey continued to a stop for tea and homemade cakes at the Lakeland Wildlife Park. The Lodore Falls Hotel provided the group with three excellent five course dinners and cooked breakfasts and impeccable service throughout their stay.